New version of DogDays App for iOS is live! Brand new and updated version of DogDays app is finally here! We’ve improved iOS version of the app drastically. New version includes not only optimizations but exciting new features as well. You can now view weather conditions and forecast directly from the app. Ideal for keeping track of perfect time for walks. There are also brand new image packs to get you geared up for 2019. 108 dog breeds are included within 198 image packs. Image packs will be available for the Android version of the app as well. App will include free bonus images that are unlockable through a series of classic puzzle mini-games that are both engaging and challenging. Collect all bonus images and share them with your friends through Facebook, Twitter or email, directly from the app. This entry was posted in Press Release, Promotions on September 19, 2018 by dogdaysapp. Cats on a site about dogs?! Well, here is a cool review of calendars dedicated to our feline friends and nemesis (depending on the way you look at them). BrownTrout Cat Calendars review is written by Ingrid King of The Conscious Cat. The Conscious Cat is your comprehensive resource for conscious living, health and happiness for cats and their humans. Ingrid King is the award winning author of Buckley’s Story: Lessons from a Feline Master Teacher, Purrs of Wisdom: Conscious Living, Feline Style, Adventures in Veterinary Medicine: What Working in Veterinary Hospitals Taught Me About Life, Love and Myself, Tortitude: The BIG Book of Cats with A BIG Attitude, and Purrs of Wisdom: Enlightenment, Feline Style. This is the time of year when I start to look at cat calendars. I usually have two calendars in my home: one in my office and one in my kitchen, and of course, they’re both cat calendars. I put quite a bit of thought into which calendars to get every year, because after all, it’s something I’m going to look at every day all year long. 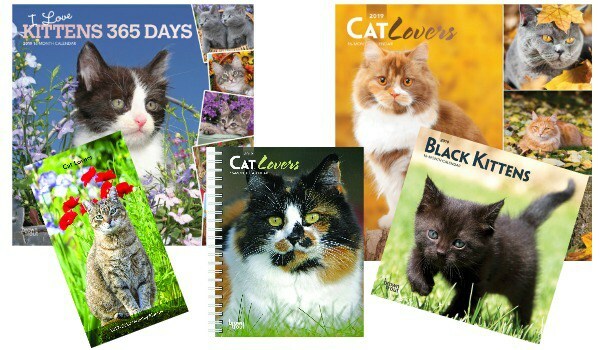 I was delighted when the folks at BrownTrout Publishing offered to send me some of their cat calendars for review. Full review available on The Conscious Cat website. This entry was posted in Press Release, Promotions on September 13, 2018 by dogdaysapp.